Perfect comfort food, this is great served with crusty bread. Melt the butter and cook the onion over a medium heat until soft and pale gold. Add the cauliflower and turn the florets around in the buttery juices. Add the stock and nutmeg, then season to taste. Cook for about 15 minutes until the caulifl ower is completely tender – it must be soft. Blend until smooth using a food processor or stick blender, and season. Meanwhile, preheat the grill to high. Grill the bread, then spread with the mustard and scatter with cheese. Grill until the cheese is melted and golden, then cut the toasts into rough croutons. 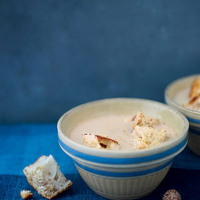 Serve the soup topped with the cheesy croutons and a light grating of nutmeg, with a green salad on the side.